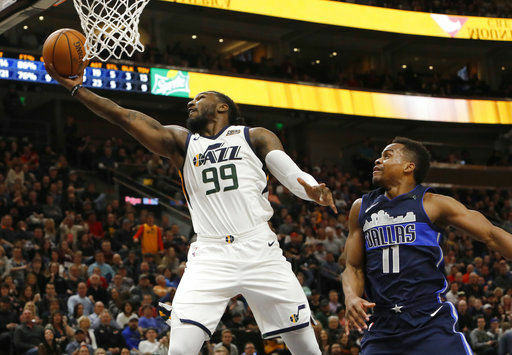 SALT LAKE CITY (AP) — The Utah Jazz turned to their defense to close out the lowly Dallas Mavericks. 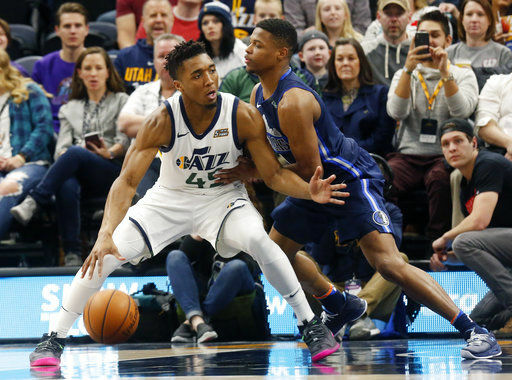 Donovan Mitchell had 25 points, five rebounds and five assists, and Utah limited Dallas to just one field goal over the final 5:12 in a 97-90 victory on Saturday night. The Mavericks missed six of their final seven shots from the field and committed four turnovers during that last five-minute stretch. After tying it up three times in the fourth quarter, the Mavericks finally took an 87-85 lead on a jumper from J.J. Barea. But Utah answered with an 8-0 run, punctuated by a Gobert dunk, to go ahead 93-87 with 2:32 remaining. Dallas looked as if it might rally after Yogi Ferrell responded to Gobert’s dunk with a 3-pointer. But that ended up being the only Mavericks’ basket the rest of the way. They turned the ball over on their next three possessions and Utah sealed the win with free throws from Jae Crowder and Mitchell in the final seconds. Barea had 17 points and 12 assists, and Nowitzki added 12 points and 10 rebounds. The Mavericks (18-42) lost for the 14th time in 18 games. Utah strung together an 18-6 run to take a double-digit lead before the end of the first quarter. Crowder drove for a pair of baskets and pulled up for a 3-pointer to help fuel the surge. His third basket gave the Jazz a 33-18 lead. It marked the second straight slow start for the Mavericks after they trailed Los Angeles by 15 points at the end of the first quarter of Friday night’s 124-102 loss to the Lakers. “We’ve had this problem all year and you know we’ve got to keep working on fixing it,” Dallas coach Rick Carlisle said. Dallas erased Utah’s advantage before halftime. Doug McDermott scored back-to-back baskets and Barea followed with a layup to ignite a 15-0 run for the Mavericks. Dwight Powell gave Dallas its first lead on a pair of free throws and then finished off the run with a hook shot to put the Mavericks ahead 49-42. Utah missed 11 of 13 shots to open the second quarter before closing out the half on an 11-1 run. The Jazz took a 53-50 halftime lead after Mitchell capped the spurt with his second 3-pointer of the night. Mavericks: Barea made his 500th 3-pointer with Dallas. He is just the eighth player to reach 500 3-pointers with the team. … McDermott scored nine of his 12 points in the second quarter. Jazz: Joe Ingles recorded his 150th 3-pointer of the season in just 60 games. Ingles is No. 3 among Jazz players for most 3-pointers in a single season, trailing only Randy Foye (178) and Rodney Hood (161). … Utah outscored Dallas 11-0 in fast-break points during the first half and finished with a 15-3 advantage. 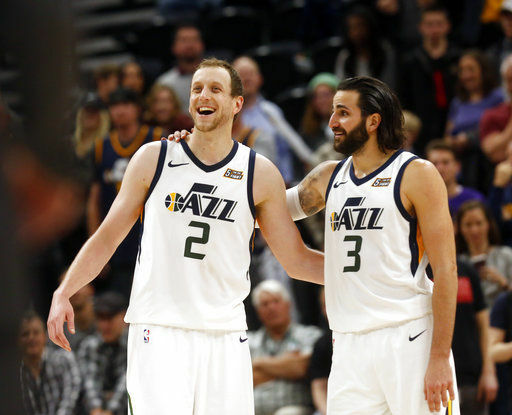 Ingles played in his 200th straight game for the Jazz and finished with 12 points and eight assists. It’s the third-longest active streak in the NBA. Since joining Utah before the 2014-15 season, Ingles has appeared in 302 of 306 possible regular-season games. He has only missed one total game since his debut season. After getting outrebounded 63-29 against the Lakers on Friday, Dallas proved more competitive on the glass against the Jazz. The teams finished with 44 rebounds apiece. Mavericks: Host the Pacers on Monday. Jazz: Host the Rockets on Monday.